The Cisco 6901 Unified IP Phone is a single-line endpoint delivering cost-effective access to Cisco Unified Communications. Designed with a trimline-like low profile, the Cisco 6901IP Phone is an ideal solution for lobbies, hallways, elevators, hotel bathrooms, or other settings that have an occasional need for voice communications services. The Cisco 6901 IP Telephone supports two incoming calls with call-waiting service. Fixed feature keys provide one-touch access to Hold, Redial, and Call waiting. Transfer and Conference can be supported by using the hook-switch similar to that of traditional analog phones. 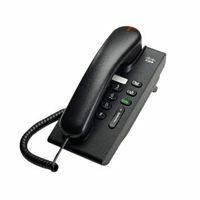 The Cisco Unified IP Phone 6901 offers personalization, with the choice of two colors (charcoal black and arctic white). The Cisco 6901 IP Phone is also an earth-friendly solution. As with the other Cisco Unified IP Phone 6900 Series endpoints, the Cisco Unified IP Phone 6901 takes advantage of reground and recyclable plastics for a more earth-responsible solution.